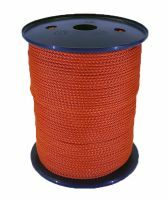 Manufactured from polyamide (the technical name for Nylon) in the UK for Ropes Direct. Cross wound on to cardboard centres and supplied shrink wrapped to keep clean. Ideal for picture hanging, brick lines, light pulls and window blind cord.